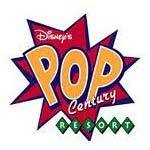 Disney's Pop Century Resort is a Disney Value Resort hotel featuring giant icons that salute many of the 20th century popular culture crazes including toys, gadgets, music, movies, fads and catch phrases. Guest rooms are located in 10 brightly colored and whimsically decorated 4-story buildings trimmed with huge letters representing iconic sayings from the decade they represent. Different sections of the hotel represent the 1950s, '60s, '70s, '80s and '90s.